Global superstar Joan Collins will be Joan Collins Unscripted touring the UK in a brand new one-woman show, including this unmissable night at the London Palladium. 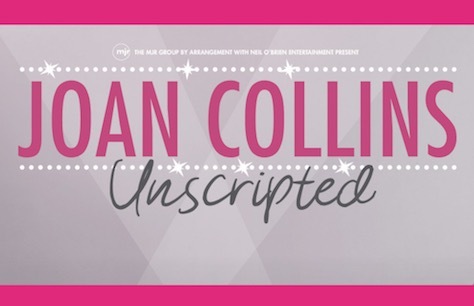 Joan Collins Unscripted will see audiences enthralled as Dame Joan reveals some of the exciting stories and secrets from her long career and also includes a question and answer session with the chance to ask questions about her life and career. Dame Joan has appeared in more than 118 feature films and TV shows, including creating the role of Alexis Carrington on Dynasty, one of the most highly rated television dramas of all time. Her novels and memoirs have sold more than 50 million copies worldwide and have been translated into 30 languages. On stage, Dame Joan has performed on Broadway, the West End, and in national tours across the UK and North America. A little disappointing the lighting was very dim so,you didn't get a very good view of the artistes and the sound could have been a little better.